The Conference was held from June 27 - 30, 2012 in Chicago, Illinois. Appraisal, or how one interprets events, is important for predicting mental health outcome in youth exposed to maltreatment. Theory from Lazarus and Folkman suggests that youth who tend to interpret life events in a uniform fashion (i.e., all good or bad) likely also have poor mental health outcomes. Researchers also posit that youth who demonstrate a range of flexibility in how life events are interpreted are likely to manifest positive mental health outcomes. To date, however, little empirical data has tested these notions. Moreover, recent research suggests that the relation between appraisal and outcome is not straightforward and that, in fact, it is likely that the appraisal-mental health outcome relation is mediated by coping behaviors. In a large sample of over 150 youth in foster care, the present study examined the nature of the relation between appraisal of life events (i.e., maltreatment experiences), coping behaviors, and mental health outcomes. This study examined how appraisal style (rigid or flexible) predicted coping behavior and how coping behavior was related to mental health outcomes (i.e., internalizing, externalizing, and adaptive behavior). The results of the present study have direct implications for clinical science and will advance the field's understanding of the process of adjustment for youth exposed to maltreatment. Reports from hotline calls made to child protective services document a child’s abuse history (DePanfilis, 2006). These reports include information on the abuse event, substantiation or unsubstantiation of the abuse allegation, and actions that were taken after the investigation, including removal from the home. However, previous research indicates that official reports differ from child self-report (Miller-Perrin & Perrin, 2007). Differences in reporting indicate that determining the severity of maltreatment based on case file report alone is inadequate. Discovering factors that predict a difference between case file report and child self-report, and the magnitude of this difference, could clarify circumstances in which reliance on more than one reporting method is preferable. 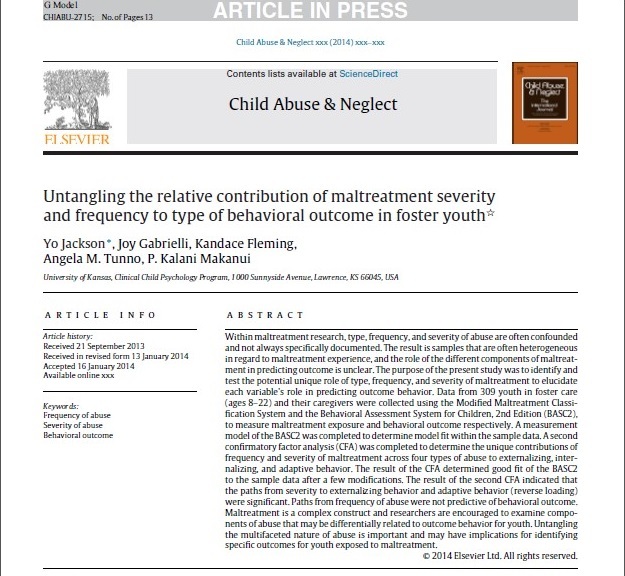 Therefore, the present study examined the magnitude of difference in reports of child maltreatment between child self-report and case file information for 100 children in foster care. Additionally, an exploration of which child-centered factors predict the greatest amount of disagreement was conducted. Factors considered were age, gender, and coping strategies. Specifically, the presentation addressed type and severity of abuse, and relationship of the perpetrator to the child using the Modified Maltreatment Classification System (MMCS, English & LONGSCAN Investigators, 1997). Placement stability is a critical goal for the foster care system (Children’s Bureau, 2011). According to the 2008 AFCARS (Adoption and Foster Care Analysis and Reporting System) report, youth in out-of-home care average 3.2 placement changes per stay in foster care. Research indicates that youth externalizing and internalizing problems predict placement changes (Aarons et al., 2010; Hurlburt et al., 2010). Alternatively, placement changes have been shown to contribute to externalizing and internalizing problems (Aarons et al., 2010; James et al., 2004). Few studies, however, have examined the role of adaptive behavior in the child behavior-placement change relation. Therefore, the present study examined the bidirectional relation between placement history and youth externalizing and internalizing problems, as well as adaptive behaviors. Scores for externalizing, internalizing, and adaptive behaviors from foster parent-reported Behavioral Assessment System for Children, 2nd Edition, were compared to the child’s number of placement changes in a sample of 200 youth in foster care from a Midwestern state. Results inform policymakers and mental health providers on the effects of placement change and mental health, which can subsequently aid in improving placement stability in the foster care system. Maltreated children have demonstrated more academic difficulties than their non-maltreated peers due to their relatively high residential mobility and school transfers (Eckenrode et al., 1995; Lansford et al., 2002). The literature has consistently shown that children’s social support is a protective factor against negative mental health outcomes (Jackson & Warren, 2000; Benhorin & McMahon, 2008). 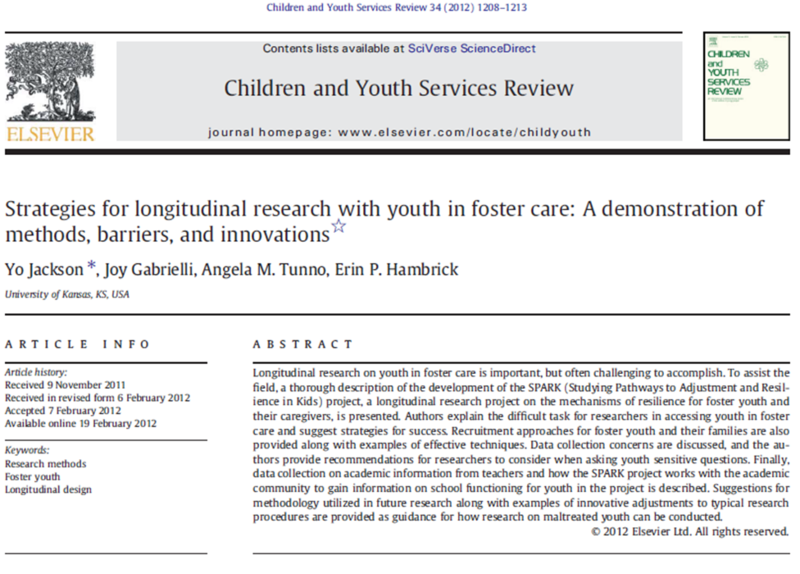 Research suggests that social support can moderate the relation between stressful events, the perception of those events, and later outcomes (Appleyard et al., 2010), however little research has investigated the role of domain-specific social support in the academic outcomes of foster care youth. This study examined the relation between appraisal of social support and academic and classroom behavior outcomes for maltreated youth in out-of-home placement. 61 teacher-child dyads were assessed; children completed the Social Support Scale for Children (Harter, 1985) and teachers reported on academic success and frequency of behavior problems. Evidence for the relation between social support, academic outcomes, and school based behavior problems in maltreated children in out-of-home placement was presented. Identifying social support as a protective factor highlights the need for improvement of social supports for foster youth and emphasizes the importance of access to community-based social supports. Children in foster care are considered a vulnerable and high-risk population (Cicchetti & Toth, 2005). As such, questions have been raised about risk management when foster youth participate in research, especially when research addresses sensitive topics like the child’s self-report of past or current abuse (Kinard, 1985; Knight et al., 2000; 2006). This presentation included discussion of strategies used to manage child reports of self-harm and ongoing abuse and ensure child safety during a longitudinal research study investigating risk and resilience in youth residing in out-of-home placements. 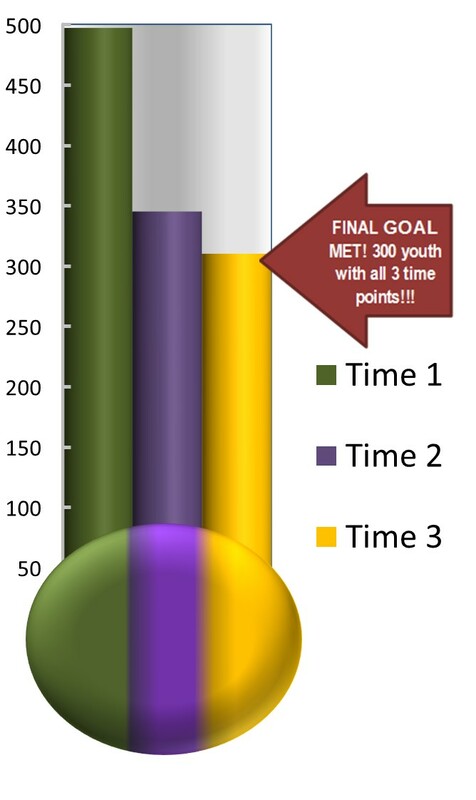 As part of the project, child participants (aged 8 to 21 years old) were asked questions via an audio-computer assisted self-interview program about previous maltreatment experiences, ongoing maltreatment, behavioral outcomes and constructs related to resilience; caregivers reported on the child’s behavioral and emotional functioning. Data on number and types of reports of suicidality, harm to others, or current abuse identified for 200 child and adolescent participants were presented. Additionally, longitudinal data on suicide-item endorsement across the three time points were assessed. Results inform researchers and clinicians about the level of risk identified through research participation in a study on maltreatment. Recommendations for future research methodology and risk management were also provided. To request any additional information on these abstracts, please email us at sparkproject@ku.edu to let us know the title of presentation for which you would like more information. Recruitment for the Time 1 surveys for the SPARK Project is now complete!